It already been a month! On Monday I was off diving at Alacala, with Josh, a customer from UK, and Flounder. The visibility was horrible with only 1 metre and the waves continuously breaking on the rock steps. We were pleasantly surprised by the rare sight of a sea snake before it was engulfed by the moving sediments, and the nonchalant greeting from the resident green turtle. The second day of diving was on Sunday at Pequeño Valley, MY FIRST BOAT DIVE in Tenerife! The visibility wasn’t great weather but I managed to see a passing shadow of an eagle ray flapping off to the horizon amongst other things. In between the two highlights of the week, brain-cells-killing tasks went underway. Jumpy, our ever-loyal van, decides to take a little holiday vacation to replace her gears. Administration works like cleaning and painting the boat, cramming dive theories and Divemaster surface skills speeches, and cleaning up the dungeons. The dungeons in case you are wondering are our special place full of delights and shiny things, also known as the store rooms! We also welcomed a new Divemaster intern from Australia. She’s a pretty cool diver and companion. Can’t wait to torture her for the Rescue Diver Scenarios! 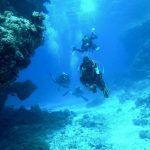 Tagged: Divemaster internship, Diving Tenerife, PADI Divemaster internship Tenerife.